With summer bar-b-que's gearing up in full swing, you'll likely find yourself playing the part of grillmaster. 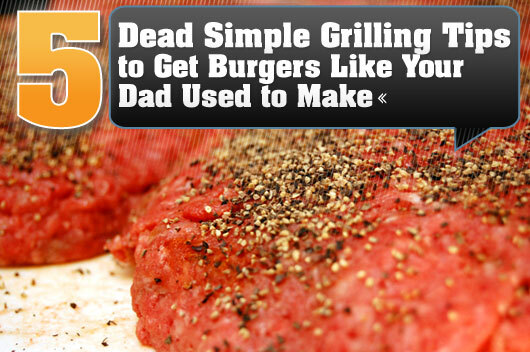 Many a men think they know how to grill a hamburger and then offer guests dry pucks on buns. Serve up the juiciest, tastiest burgers with these couldn't-be-easier grilling tips. The secret to a burger with a lot of flavor is lots of salt and pepper. When you think you've got enough, it's not, keep pouring. If your burgers are coming out bland or the meat doesn't seem to have much taste other than grill smoke, this is why. It's honestly very hard to over salt and pepper a burger. Put so much pepper on it that people will think you're out of your mind. They'll thank you after dinner. And Worcestershire Sauce? Bread crumbs? Garlic? Keep 'em for the meat loaf. First time grillers will form patties that look to be a good size but fail to take into consideration that they will shrink on the grill as the fats melt. For a normal sized hamburger people are used to try aiming somewhere between a quarter and a third pound of meat per burger. They're going to look massive in the kitchen but anything less and the cooked burger is going to look minuscule on top of the bun. The actual grilling of the meat is the shortest, and fastest part of the process. Heating up your grill so it's nice and hot before you stick anything on it is one of the most important rules to remember, and it could take up to 30 minutes. Put the patties on the grill and flip them halfway through. That's it. Depending on how hot your grill is and meat temperature preference, it should take about 5 minutes a side. And for the love of Pete, don't press down on the patties. Sure, it makes an awesome sizzle sound but you're literally SQUEEZING ALL THE JUICES OUT. The right bun is as important to a burger's flavor as the crust is to a pizza. Don't buy the $1.09 8-pack, try a kaiser roll or even better ciabatta rolls. Cheaper buns tend to be fluffy and dry, so doin't skimp in the bread department. While not directly related to the burger's taste this will keep your guests from getting food poisoning. When not in use, slide your spatula through the grates of your grill until it will balance by itself. With the spatula only a few inches from the heat, this will aid in killing off anything nasty from the raw meat. 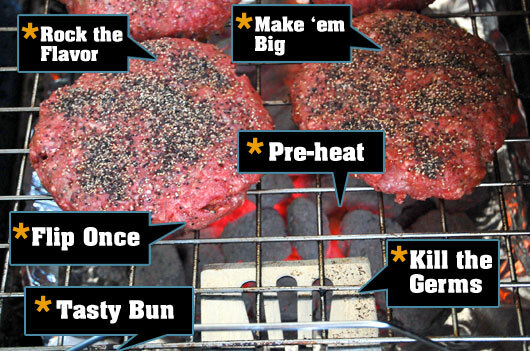 What are your burger grilling secrets? Have a tip that always pleases when it comes to burger de cheeses? Share with us in the comments! PERFECT article for the upcoming weekend. Thanks. Great tips. Especially about the burgers. I was the rookie constantly flipping the darn things. Not anymore. .-= Matt´s last blog ..Silicone Spatula – Helpful tips and resources =-. Great article! Correct preheating and flipping of meats on a grill is crucial to making sure the final product is cooked well throughout! 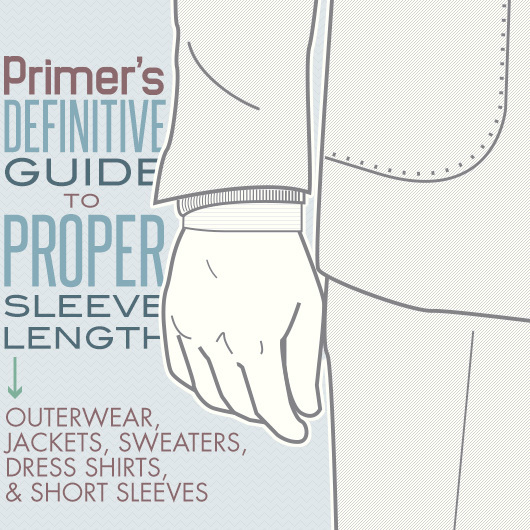 Very helpful resource here, good work! Great tips on the salt and pepper. My dad always used Seasoned Salt and Garlic Pepper (both from the Lawry’s brand) instead of jsut salt and pepper for a little extra flavor. While it should be assumed, it’s always worth mentioning that when you’re about 2/3 of the way through pre-heating, scrape the grates after the heat has burned/loosened some leftover materials with a metal brush. Sorry guys.. Not correct.. Flipping only once actually makes it cook less evenly.. Since it only cooks from one side, flipping more often allows each side to heat up a little more slowly, which reduces the amount of over-cooked meat on either side..
i personally like to put a little worcestershire sauce and garlic in my burgers. For every pound of beef, I like to mix in a cup of bread crumbs, one egg, and 1/2 cup of water. The egg acts a binder so the meat doesn’t fall apart. The bread crumbs soak in the grease so they’re not lost during the cooking. And the water helps cook the beef evenly and more slowly. Make the patties. No mixing stuff in the meat, mushing it all up, and whatnot. That destroys the texture of a ground beef patty. Once the patties are made, garlic powder, freshly ground salt and pepper, and a splash of Worcester sauce are all those burgers need. Well, that, and pepperjack cheese, bacon, and jalepenos fried in the bacon grease, all placed on a bun toasted on the grill. Thank you for that 1st point. If you have to put a bunch of stuff in or on the meat, you need to find better meat. Same rule for steak.